In 1783, when David Hosack was a young teenager, William Livingston, governor of the state of New Jersey, received a letter from Hector St. John de Crevecoeur. Having just published his Letters from an American Farmer, Crevecoeur was now writing in his new role as French consul. He presented to Livingston, as he did to the governors of New York and Connecticut, a formal proposal from the French government: should New Jersey establish a botanical garden, the French would share specimens from their collections in exchange for American plants. The offer from the French was indicative of the forward thinking and botanically aggressive policies of the French government, who could safely claim to have one of the most fully furnished botanical gardens in western Europe, and hence in the world. The Jardin royal des plantes médicinales, launched in 1626 with the support of Louis XIII, had grown substantially and was understood to serve the king and state in all matters botanical. Royal scientists collected and cultivated plants and studied them for medicinal and other uses. By the time Crevecoeur contacted Governor Livingston, the French had created a finely tuned colonial botanical machine with which they proactively sought out plants from around the globe in order to grow their own geopolitical power. Governor Livingston passed along the French proposal to the Assembly of the State of New Jersey and reported to Crevecoeur that the Assembly expressed thanks and “to assure him that whenever this state hath formed an Establishment of a Botanical Garden, His Most Christian Majesty’s offer will be gratefully accepted.” In other words, if New Jersey ever decided to build such a garden, the French would be welcome to contribute specimens. But New Jersey did not build a botanical garden. Nor did New York or Connecticut (though a New Haven medical society tried.) The French quickly lost patience with the young Republic and decided to bypass it in 1785 by sending their own botanist, André Michaux, to carry out the French mission. Michaux established a nursery garden in New Jersey that excited the curiosity of Americans, but ultimately the French failed to excite support to build an American botanical garden. 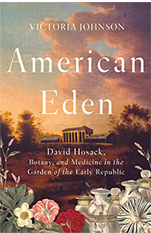 American Eden is first and foremost a biography of Hosack. Johnson’s biography begins with his Hosack’s early quest to acquire a medical education. He began his formal training at Columbia College in 1786, but also became an apprentice to London-trained military surgeon Richard Bayley, whose work at New York Hospital and anatomical dissections provided practical training. When public suspicion grew around his anatomical dissections in 1788, Bayley’s laboratory came under attack, Hosack chose to continue his education at the College of New Jersey (now Princeton). He returned to New York for advance training, and then in 1790, moved to Philadelphia where he studied under Benjamin Rush. But Hosack yearned for more rigorous medical training. In 1792, leaving his wife and child with his parents, set across the Atlantic to study at the University of Edinburgh. There, he embarked on a rigorous course of study, but quickly realized the extent of the deficit in his knowledge of medical botany – which was essential to the British approach to the study of medicine. To correct that deficit, he proceeded to London where he studied with William Curtis in the Brompton Botanic Garden. In so doing, he developed a life-long passion for botany and a strong conviction that botanical knowledge was key to improving the practice of medicine. Back in the United States, Hosack launched his professional career in medicine, a lengthy and vaunted career that, through his prodigious energy would include teaching botany of Columbia and eventually medicine at Columbia and its rival The College of Physicians and Surgeons, maintaining a private medical practice through which he catered to an elite roster of patients including Alexander Hamilton and Aaron Burr, but also saw patients at charity hospitals, all while encouraging the growth of the arts, sciences, and especially botanical sciences in New York City. Central to all of these efforts was Hosack’s establishment of a botanical garden in New York City. Johnson narrates his crusade to build one against the backdrop of the history of science and medicine in the eighteenth and nineteenth centuries. For Hosack’s discovery of medical botany coincided with a golden age of the study of plants in Britain, France, and the Sweden of Carl Linnaeus. In America, Thomas Jefferson and George Washington were only two of many American elite gentlemen who were enthusiastic gardeners and plant collectors. The most serious collaborated, conversed, and collected via the informal but cosmopolitan “republic of letters,” and formal academies and societies: Hosack was elected a Fellow of the Linnaean Society of London after his studies there, and was eventually named a Fellow of the Royal Society. And like his contemporaries, he believed that unlocking the secrets of botany could bring about a revolution in the practice of medicine. If Linnaeus had, through his classification system, found the key to identifying the similarities between different plants, similarities between their medicinal properties could be identified, tested, and deployed pharmaceutically. The medical field, too, was experiencing great change, as practitioners finally began to abandon the millennia old theory of the humors in favor of practices developed from knowledge gleaned from anatomical and pharmaceutical study. The assemblage of an encyclopedic botanical garden was therefore essential, and New York City, let alone the United States (as the French had lamented), did not have one. Hosack launched his efforts to create one in 1801 when, with his own money, he purchased the first of several plots of land north of Manhattan and began the construction of the garden that he would call Elgin Botanic Garden after the Scottish birthplace of his father. It would eventually include a handsome conservatory and thousands of plant specimens that Hosack himself had collected, or had acquired from his now international and extensive botanical correspondents in Britain, France, and the frontiers of America. It was an astounding achievement that drew visitors and botanists from around the country. Its purpose was both practical and commercial: in 1807 he advertised in a New York newspaper that “Our citizens are now informed that they can be supplied with Medicinal herbs and Plants, and a large assortment of Green and Hot House Plants, & c.” But it was also a labor intensive and expensive endeavor that Hosack could not financially sustain on his own. He therefore waged a decades long and ultimately unsuccessful bid to convince Columbia and the State of New York of the benefits of their first, taking ownership of the garden, and second, appropriating sufficient funds for its maintenance, and the garden eventually fell into ruins. Even the scientifically forward thinking Thomas Jefferson initially rebuffed his efforts. The garden then, no longer stands – the site, then in the wilderness that lay to the north of the city, is now midtown Manhattan, and covered by Rockefeller Center. Yet, as Johnson writes, despite the failure of the botanical garden, Hosack’s “greatest legacy is perhaps the one that is hardest to see. He showed his fellow citizens how to build institutions.” And in this sense, Johnson’s biography is also a history of New York City and its emergence over the course of Hosack’s professional life as the financial and cultural center of the new Republic. Johnson’s account transports the reader back to a late eighteenth-century-early nineteenth-century New York City that is both crackling with intellectual excitement and political possibility, and frighteningly gritty and dangerous. The essentiality of Hosack’s work was forced upon him throughout his life: as he strove to create medical and pharmaceutical knowledge, he was unable to save his first wife, his first child, Theodosia Burr, Alexander Hamilton’s son, and then Hamilton himself, let alone the hundreds and hundreds of patients lost to Yellow Fever, smallpox, and many other communicable diseases that plagued colonial America. So Hosack soldiered on, a leading, but by no means only force in Enlightenment America who believed in the potential of the new nation and the progress of science. He built networks of botanical and scientific exchange with the leading botanists of Europe, cultivated rivalries with contemporaries like the Peales in Philadelphia, and tirelessly contributed to and shaped the learned societies and institutions that would shape America such as the New York Historical Society and the New York Horticultural Society, to name just two. And, as Johnson documents, he inspired generations of American botanists. One of his last students, John Torrey, as leader of what came to be called the Torrey botanical Club, cultivated sufficient interest and political support such that after his death, sufficient financial support could be extracted from the wealthiest New Yorkers to create the New York Botanical Garden, one of the most important botanical institutions in the world today. The young United States could not be persuaded to fund a national botanical garden until the Columbian Institute for the Promotion of Arts and Sciences pushed a bill through Congress, and signed by President Monroe in 1820, granting them a plot of land for such purposes. And even then, it would take years before serious plant collecting would begin. Hosack, then, was ahead of his country, even if his own botanical garden did not survive. Hosack himself died in 1835. And while the publisher of American Eden has frustratingly opted to forgo footnotes, through Johnson’s erudition and perceptibly exhaustive research into the archival sources of Hosack’s life and times, the reader will be both delighted to go on the journey of his life and convinced that he left the world and his city in a far better place than he found it.